Once you've seen flameless candles in action, you'll likely wonder, where can I purchase flameless candles? These little lights mimic natural candlelight, without any of the drawbacks of using an open flame. Flameless candles resemble candles in shape and size, but instead of using a wick and flame for light, they are operated by batteries and use LED lights. Many flameless candles are made of wax, just like regular candles. 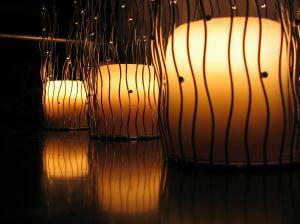 They come in a wide variety of sizes and colors, mimicking candle shapes from pillars to votive candles. Some flameless candles are enclosed, with the light glowing from a bulb within the container. Others actually resemble a flame, and many flameless candles will flicker, imitating the natural movement of a lighted candle. You can also purchase scented flameless candles. For example, Glade makes a scented flameless candle, called the Glade Wisp, that has a strong fragrance and is reasonably priced. You can use them outdoors without worrying about the flame being extinguished by the wind. They can be placed in small, enclosed spaces without fear of burning or singeing nearby objects, furniture, or walls. You can have these candles out where there are young children or pets present. They can be left unattended without worry. You can safely use them in candle arrangements, such as table centerpieces, along with dried flowers or other flammable materials. There is no soot or residue after use. They are safe for use in wall sconces and candle chandeliers. They can last for years, since they run on batteries. When flameless candles were first introduced, they tended to be difficult to find and quite expensive. Now that they have caught on and become popular, they have come down in price and can be found in many retail outlets, both online and in person.If you're asking yourself, where can I purchase flameless candles, the good news is that you can find them in lots of places! You can purchase flameless candles at many different retail stores. Here are some suggestions. The internet has brought with it the convenience of shopping at home. If you're looking for a specific type of flameless candle that you can't find locally, or just prefer the simplicity of shopping from home, here are some web-based businesses that offer flameless candles. Flameless Candles - There is a huge selection of flameless candles here, including candles that have a timer. You can set the timer to turn the candle on at the same time every day, and it will run for five hours before shutting itself off. Lowe's - You can order them online or in store. Amazon.com - Amazon started out as a book seller, but they have grown to include almost anything you might need to purchase online. Of course, this includes flameless candles, and there are many to choose from. Flameless candles can be the perfect option for candle lovers, when there is a need for safety and convenience. Finding them available for purchase either online or in a physical store is almost as simple as using the candles themselves! .